The March 10 victory in the Slovak parliamentary elections  is not the first one for the SMER-Social Democracy  party. Formerly a communist, now a social democrat, the party's leader Robert Fico  has won for the third time in a row already. In 2006, SMER had 29.1 percent of the popular vote (50 out of 150 seats). 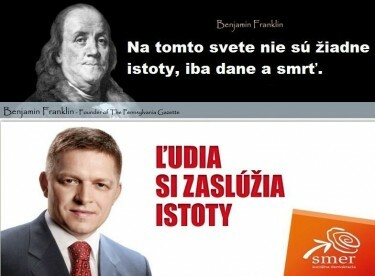 To form a government, however, Fico needed two coalition partners; one of them happened to be the Slovak National Party  (SNS), whose leader, Ján Slota , was notorious for his anti-Roma and anti-Hungarian comments. Because of this partnership, Fico ended up having problems  with the European social-democratic structures. Other right-wing parties refused to cooperate with SMER, accusing its politicians of corruption and overspending that “leads to Greece .” Fico, who had publicly declared shortly before the elections that he would never accept the role of an opposition MP, became one. When at the end of 2011 the right-wing government fell  because of disagreements  over the European bailout fund, it was expected that this would be the main topic of the election campaign. But just a few weeks later, the so-called Gorilla Scandal  broke out, due to the publication of the transcripts of secret meetings between the head of Penta, a Slovak investment group, and people from various governmental structures, which allegedly took place before 2006, when nearly the same right-wing government as in 2011 was in office. The transcripts featured discussions of state economy-related topics and expensive offers. The recordings were made by the Slovak intelligence service (SIS), as part of an operation that had begun accidentally, because one of the SIS agents happened to live in an apartment next door. The text version that was made public is not the exact transcript, and it is not clear whether all of its parts correspond to the original. It is also not known when, if ever, the participants of the secret meetings realized  [sk] their conversations were being taped. And it is not clear who made the transcripts public, although it is now obvious that some media, as well as some politicians, knew about it, but were afraid to deal with it. SDKU , the main right-wing party affected the most by the affair, started its “suicide ride” by simply denying everything. The party's leader Mikulas Dzurinda  declared that he had not even read the transcripts to the end. In one of the latest pre-election surveys, SDKU wasn't getting enough votes to get into the parliament. Penta, too, denied everything, and unleashed its lawyers, who achieved a very fast court ban of the book  about the Gorilla case. For a while, they also tried to take action against Facebook as one of the places where the papers had been published. The publication of the transcripts caused protests  across the country, the last one of which took place the day before the elections. The numbers of the protesters in Bratislava ranged from over 10,000 to just a few hundreds, with the unusually cold weather being an obstacle to making the protests more numerous. A few conflicts with the police took place  [sk] during the protests as well. At the beginning, the organizers had quite unrealistic demands, such as postponing the March 10 elections until autumn, when, as they expected (somewhat naively, perhaps), the newly-started investigation would bring results. The vote, however, took place as scheduled, and this cartoon  conveys the voters’ mood very well. Below is a short selection from a web discussion that followed this article  [sk] about voter preferences on the eve of the elections. The rescue of SDKU = the rescue of the Dzurinda-[Miklos ] duo. And such persons perhaps today no sane man can rescue. They do not deserve rescue. I gave them my vote in 1998 and 2002. … But a party that is spitting at its voters and even in the last days their nominees care about their own bussiness … such a party does not deserve support. Congratulations to the winner of the elections. The people decided and we, who did not vote for him, will carefully watch how the idea of a welfare state is promoted. … And when SMER succeeds and, more importantly, has no scandals like those in the past … it can be that in the future I will vote for them. It would be nice, but seeing what the first statements of Mr. Fico are, in terms of PPP projects  and the planned progressive taxation, I am afraid that it will be exactly what we had here two years ago.